The Oscars came and went and with them my fantasies of being a fly on the wall at Wolfgang Puck's Oscars party catering kitchen. I wouldn't interrupt, for the most part, just let me in to experience the commotion and sneak a slider or two, while the perfectly starched, uniformed waiters, zip by with the trays carried so elegantly high. I knew the answer was not only the right recipe but the consistency. Consistency that I knew could only be achieved with a meat grinder. Thank you all my friends who chimed in and helped in the decision process of old fashion versus what you all wholeheartedly recommended, a Kitchen Aid attachment. It works wonders. In my search I came up with a couple winning recipes so stay tuned for more in the near future. My findings might be subjective but I do not like the recipes that called for bread, it felt like a filler. I also like my falafel fried not baked just like my doughnuts. I was happy with consistency only after I purchased my meat grinder. I also love how ingredients like cilantro, onion and garlic become one with the chickpeas in the grinding process. Often these reasons, consistency and meshing of the ingredients together, are why recipes for meat or fish kebabs ask to run ingredients through a meat grinder. Lastly, since I didn't have the falafel scooper, and the melon baller and ice cream scooper didn't work well for me, I rolled the balls gently by hand and placed them on a slotted large spoon and lowered them gently into the oil. Test that oil is hot enough with one falafel first. Don't over crowd the deep fryer or deep pot you are using to fry the falafel. This mix has a lot of moisture in it since I added a large onion for flavor. If you wish for less moisture and an easier to work with mix, than you might wish to add only a small onion. The jalapeno was my idea. It blended well, gave it a zest without overpowering the fritters. Heat up oil on medium heat in a deep pan. Rinse and drain chickpeas, add all the ingredients except the oil and last tablespoon of flour in a large bowl and grind through a meat grinder. Mix lightly with a rubber spatula and then add the last tablespoon of flour to the mixture. 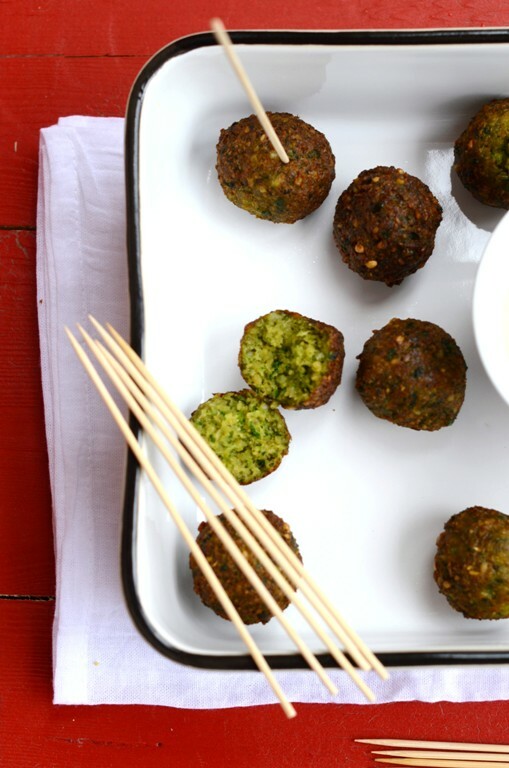 Gently roll falafel by hand, place on slotted large spoon and gently lower into oil. Falafel should quickly rise to the surface. You might need to reduce the heat if the falafel fritters get dark too quickly and do not cook inside. Cook for a few minutes and drain on a paper towel. Serve in a pita with Israeli salad, cabbage slaw, tahini, harissa and pickles or just as cocktail bites with a tahini sauce. Mmmhhh, I love felafels! Those looks so good. i can't wait for your recipe post!!! i love falafels!! Aww TY Johanna I will check the food and wine link. I always like exploring further. Falafel - Ah,I love that stuff!I remember making Falafel and Shawarma in college with friends,and we had them with Tzatziki - delicious! Aww you made it in college? Somehow I don;t see most college kids now days making falafel. :) Tzatziki is another way to serve it though I must admit I always have it with tahini & harissa, Israeli salad, lemon coleslaw & pickles. 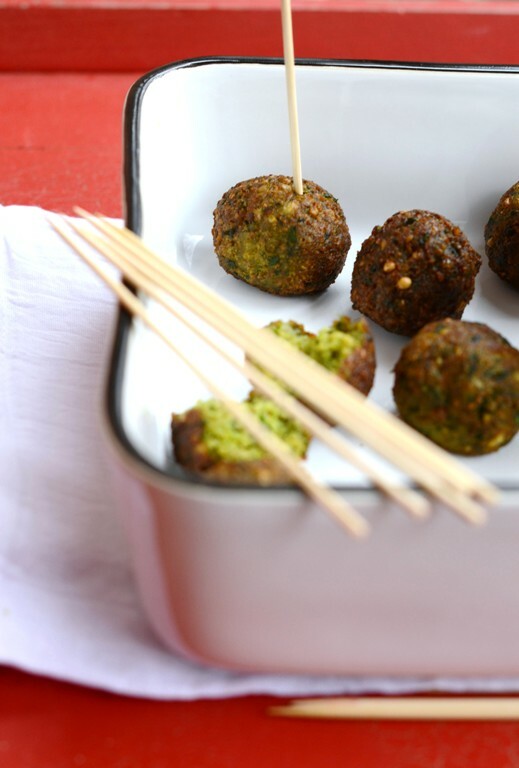 I love all the work you put into this falafel recipe! It looks just perfect, and well worth all the effort. The meat grinder is quite a brilliant idea! TY Katherine. It was a fun process and well worth result if it were not for the oil recycling issue. It sat on my porch for few weeks before I did. I don't know how I survived w/o a meat grinder so far. I need it for so many things. Love favorite neighborhood spots. I wish I had one nearby. If you are in NYC go to TAIM. They got an amazing falafel! Do I dare admit out loud and to the world that I've only made falafel from a mix. I can do this!! Thanks for the inspiration. ahaha Maureen I love confessions! :) Yep. You can! Adjust it to your taste. TY for the entertaining comment! i don't like bread used falafels either!! Your recipe is almost like the one I used a while back and tasted great. But since fresh falafels are so easily available I never tried it again!! Now i know i shd! ahahaha Kiran, love this comment!! :) TY for brightening up my morning! They look delicious! I like the red board, too :-) It is fresh. TY Lakshmi. SO sweet of you. Yep I got lucky with the board. I am yet to explore the styling possibilities and dofferent moods to lend to it. Just at the beginning of exploring that color and background. A meat grinder! How incredibly clever. looks yummy! and I like the idea to put chickpeas into it. If you don't mind, I put the link where I learned how to make Traditional Falafel and experienced virtual cooking. OMG! I cannot wait to make this! Chick peas are wonderful. I could munch on them all day long. 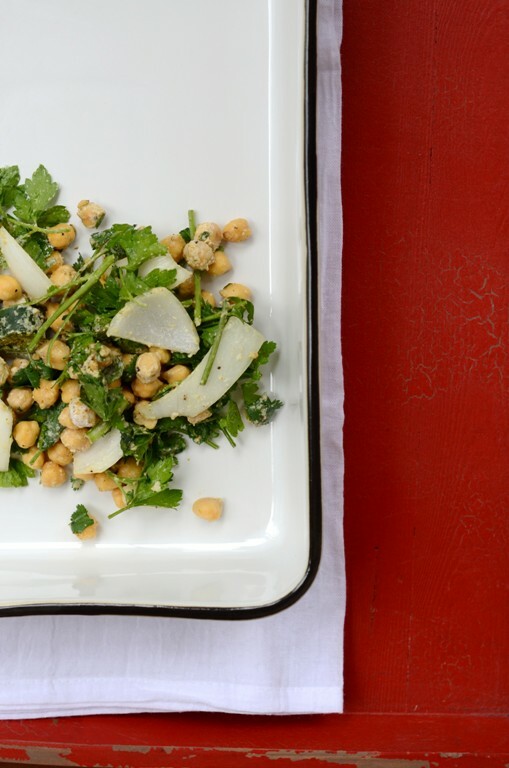 This recipe is certainly making more of the humble chick pea. I hope, I get to make this, soon. I made these tonight but since I don't have a meat grinder I used a food processor. I found that it is difficult to get the right consistency this way, but it still came out great. I actually added sesame seeds to it and that was a nice addition too. Tempting... I might go this route this weekend! Now I want one of these!! 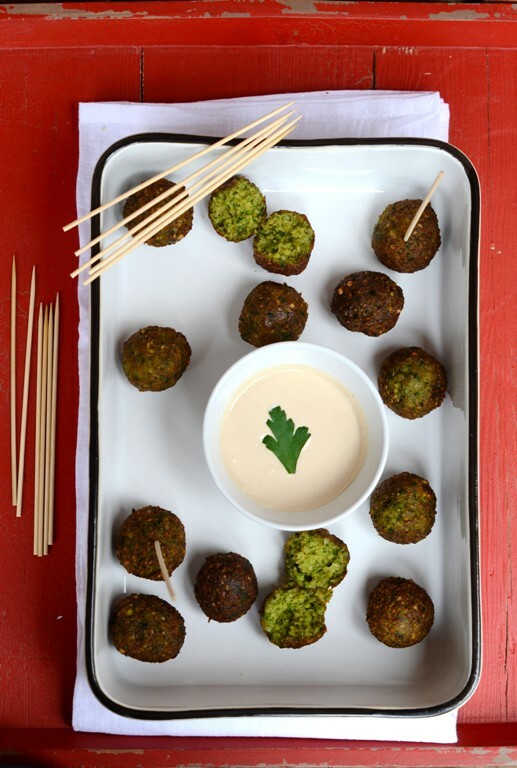 I love the idea of green falafels. Correct me if I'm wrong, but won't the 1 cup of both parsley and cilantro be very overwhelming? Also, what would be a good alternative for those since my family is not a big fan of either. I can see how it might seem so but it's the green in the green falafel. It tastes great. You can add maybe a little bit of dill instead but it will change the flavor profile. It is also not traditional. Alternatively you can just omit the green altogether for a more traditional falafel?! 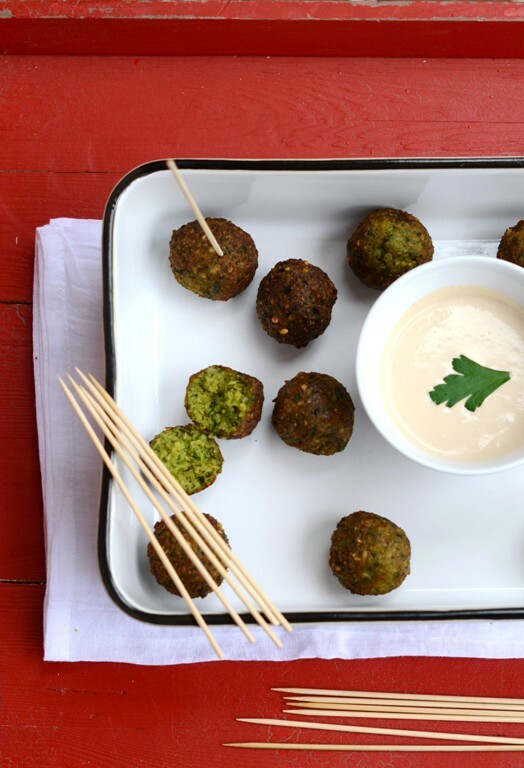 I LOVE the idea of green falafels! Correct me if I'm wrong, though, but won't 1 cup of parsley AND cilantro be very overwhelming? Also, my family doesn't really like either of those, so what would be a good replacement for the green in the falafels? Falafel is without a doubt my favorite food! I've tried making it a few times myself and it came out so very bland. :( Just ate out and had some beautiful, fluffy green balls of heaven. Decided to give it another try. I think your recipe sounds right on the money..thank you so much!! I recently had to go gluten free so I will try substituting rice flour..Hope it works!